The Better Bladder Method® was developed by Dr. Carlos Gabriel more than 4 years ago at the Bond Clnic, PA in Winter Haven, Florida. Their unique treatment plan helsp cure bladder problems in the least invasive and discrete way possible. 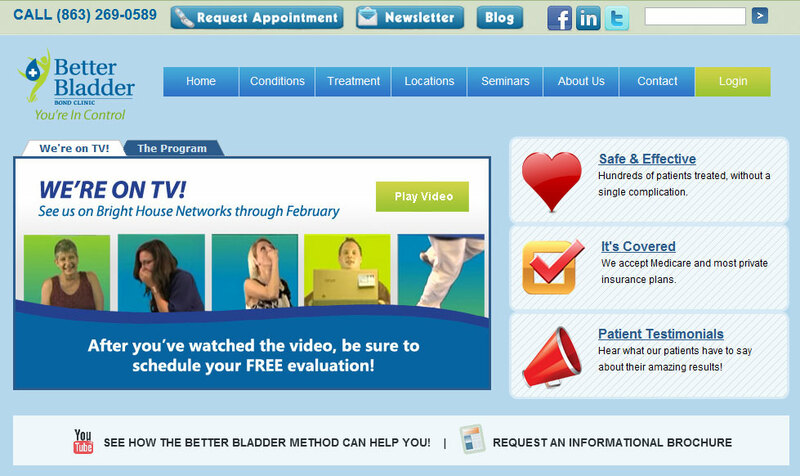 The Better Bladder Center expanded throughout the Polk County, Florida area in 2011, and The Nissen Group was asked to create a marketing plan that would help create a foundation for growth for the business. We started out by designing custom brochures in the areas of Program Information, Caregiver Information, and Patient Education. The brochures were so successful that multiple reorders were necessary. We then began designing an all-inclusive 24-page Patient Education Booklet, which is given to all new patients when they enter the program. With the internal phase complete, our next steps were to generate buzz with the local community. We created a-frame signage to be used at local community events, as well as promotional items such as sticky notes and hand sanitizer pens. A unique commercial was launched in October 2011, introducing the program using a musical mashup of sounds associated with bladder control issues - such as sneezing, coughing, laughing, and lifting. The Better Bladder Center is on its way to becoming the leading provider of bladder control therapy in the county.